OPEN HOUSE EVERY SUNDAY-THURSDAY FROM 1-5 PM OR BY APPOINTMENT. 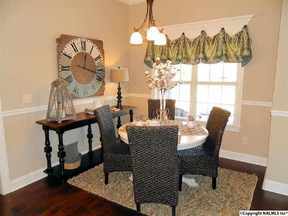 THIS HOME IS NOT FOR SALE but is the Model in Somerset, a Mark Harris Homes Community. This huge open ranch plan offers 10' ceilings, hardwoods, 7" custom crown molding. The Kitchen offers an enormous flat island, granite & large pantry w/wood shelving. Stacked stone, vented gas f/p flanked w/ bookshelves on each side in Family Room . Spectacular 12'x16' Master Bath w/ 11' dual vanities w/ an abundance of drawers, separate shower & Amazing His/Hers closet w/ wood shelving. Granite in all baths. Isolated Guest Suite w/bath. Can be built w/ a bonus & bath up. Community Pool, Cabana, and Playground.